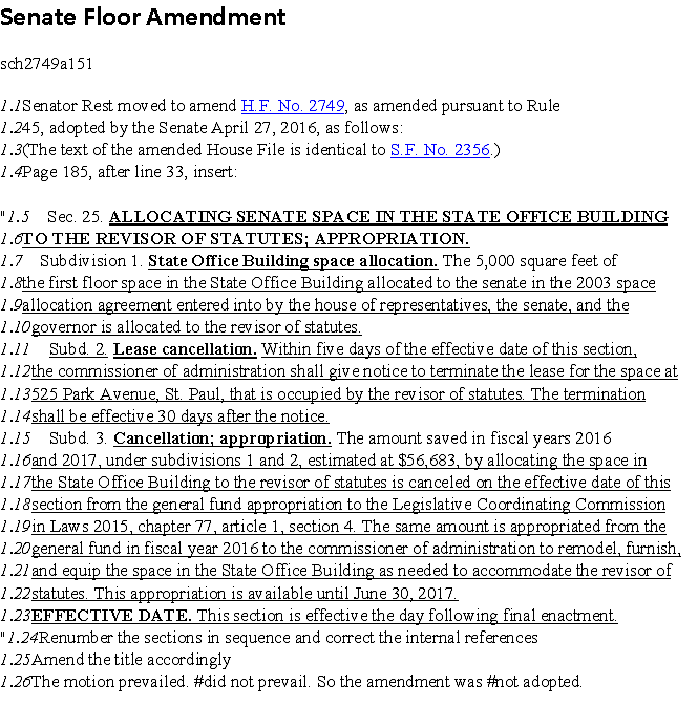 Sen. Rest and her DFL colleagues don’t care about saving taxpayers money. If they did, they would’ve highlighted the foolish spending within the MnSCU Central Office and at St. Cloud State. If the DFL was sincere about saving the taxpayers’ money, where were they when they voted for this Taj Mahal for politicians? Republicans shouldn’t take Sen. Rest’s spin seriously. Until the DFL admits that the Senate Office Building was a taxpayer-funded boondoggle, Senate Republicans should remind taxpayers who’s looking out for them and who’s looking out for themselves. Thursday morning, an email came from the Vice President for Finance and Administration Tammy L. McGee announcing the departure of the Director of Human Resources Holly Schoenherr. Holly was responsible for the Great Place to Work Survey. The results of the GPTW Survey can only be described as an indictment of the administration (others might say a vote of no confidence in the administration). Additionally, the ‘reorganization’ of the Human Resources area has been described by some as a ‘house cleaning’ where a number of key long-time employees left out of exasperation. Heather Weems was hired in June of 2012 as SCSU’s first female athletic director replacing Morris Kurtz who had been SCSU’s athletic director for twenty-seven years. Less than four years later, just after cutting 6 sports programs, negatively affecting 80 out of 530 student athletes, it appears that she is looking to leave SCSU. On March 31, 2016, Heather Weems was announced as one of four finalists for the Athletic Director position at Grand Valley State (the position ultimately went to another person). Mark Springer was appointed Dean of the College of Liberal Arts in May 2012. Although it has long been rumored that he was applying for positions elsewhere, this April he finally became one of four finalists at Montana State University. After interviewing on April 14, 2016, the selection of the new dean has yet to be announced. Last year, after only one year on the job, the Associate Provost for Student Success and Dean of the University College Dr. Bruce Busby decided to retire rather than continue working at SCSU. The listing for the University College is listed below. On top of these duties, the latest reorganization added oversight of the Summer School program and concurrent enrollment programs (S2S) to his list of responsibilities. Overseeing these two programs is almost a full-time job by itself. When added to what amounts to the workload of four or five positions, he must have been thought to be Superman. While given the current financial circumstances it is clear that people will be expected to do more (with less)—this is simply ridiculous! It is not hard to understand why Dr. Busby might have chosen to leave SCSU for retirement back in Ohio. Not only is the weather better, he won’t have to wear as many hats! In fact, he won’t have to wear any hat unless he’s fishing in the Mighty Maumee River. As an interesting side note, two people have now been tasked with the responsibilities that were formally assigned to Dr. Busby. With all of the ‘reorganization’ that has occurred since President Potter’s arrival in 2007, SCSU must be the best-organized university in the country! Unfortunately, it seems that the pattern for most administrators at SCSU is to come in and reorganize and then leave BEFORE the full effects of their reorganization are known. 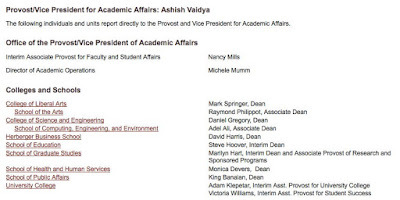 Looking at the list, Provost Ashish Valdya is in his first year. Dean David Harris is in his first year. For the Colleges and Schools, there are four interims listed. The majority of the deans and associate deans were interim deans before being appointed to their permanent position. None were in permanent positions prior to 2012. As a result, this administrative team has very little institutional memory since none has been in their position on a permanent basis for more than four years. Additionally, at least one is actively pursuing employment away from SCSU. One can always choose to look at administrators leaving as an example of those people being the ‘best’ who have lots of opportunities. However, when you see the sheer number of administrators who have left, SCSU must be the “Harvard of the Administrative World.” Unfortunately, with a large number of interims being appointed to permanent positions, it is also likely that it decreases the applicant talent pool because qualified candidates ask themselves if it is worth the effort to apply if the interim is going to be appointed to the permanent position in the first place. Clearly, there are qualified individuals that have been appointed to permanent positions after previously serving as an interim. 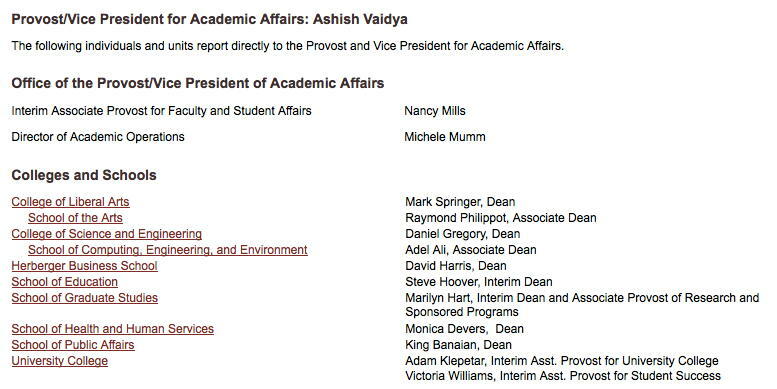 However, of the permanent deans or associate deans, only David Harris and Adel Ali were not interims in their positions before becoming permanent. The administrators at SCSU don’t seem to have a lot of experience. Hopefully, these inexperienced folks won’t be making too many mistakes for the first or second time. Unfortunately, with a declining enrollment and dire financial situation, SCSU can’t afford too many more mistakes in the first place! What SCSU Needs: A Beer Major! According to the article, “We know this is a growth industry and our students will be well prepared to gain employment in this field.” As a result of enrollment declines and the concomitant budget deficits, SCSU’s President Potter is beating the bushes to grow enrollment by creating new programs. 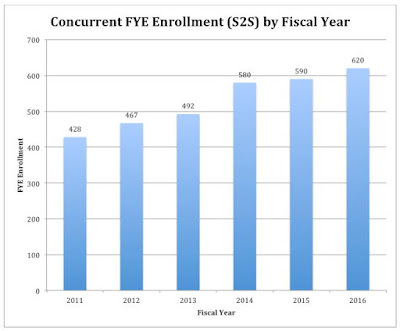 With an on-campus FYE enrollment decline from FY2010 through FY2016 of 24.5%, rushing to create new majors to attract students seems a bit like an act of desperation. 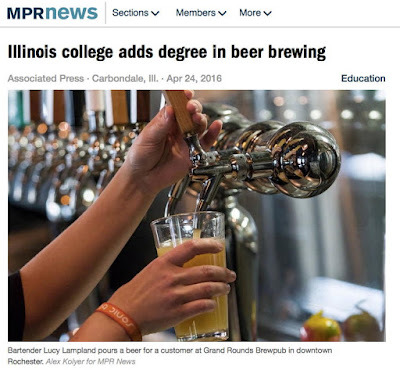 However, in this case, a ‘beer major’ fits in well with the university’s decision to sell beer at hockey games “to enrich the student experience.” In fact, with the explosive growth in micro-breweries, the potential for a “Husky Brew” to enhance the SCSU brand is obvious. SCSU could be the first MnSCU university with its own brew! Think of all the free publicity you could get for that! After Colorado legalized consumption of pot, applications at the University of Colorado at Boulder increased by 30,000 applicants in the first year. 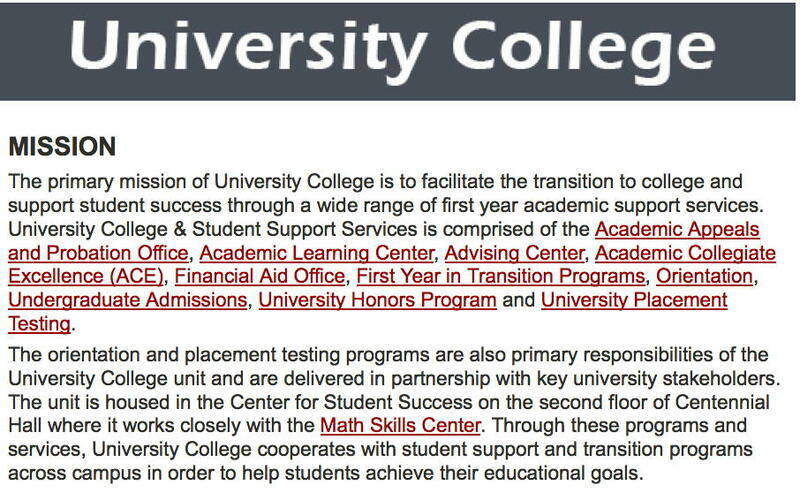 So considering the recent enrollment declines this seems like a natural decision for SCSU. The MPR article ends with the statement: “a 74,000 square-foot, geo-thermal building called the McLafferty Annex Collaborative Research Facility on the campus’s west side will be home to the program.” Another plus would be that a ‘beer major’ would fit in well with the intended purpose of the Integrated Science and Engineering Laboratory Facility (ISELF) and in even a cursory walk around the ISELF building it is clear that there is plenty of space available to house it. As a result, SCSU already has available building space for the program saving millions in building costs. A Beer major would be a natural tie in to Husky Hockey beer sales with the potential for additional revenue coming from eliminating the middleman. All that would be necessary is to simply run a line from the ISELF building to the Brooks Center and voila, Husky Brew on tap! And you can’t say it wouldn’t be popular—I’m sure there would be all kinds of interest! If there’s a message that comes through loud and clear in this op-ed, it’s that Mike Vekich, the current chairman of the MnSCU Board of Trustees, and Dr. Rosenstone, the current chancellor or MnSCU, think MnSCU is underfunded. However, the costs are not going to end at $617,000. New signage, stationary, documents, websites, etc. will be needed. Clearly, this will not occur without an additional cost. Silence is right. Signage, stationery and other documents don’t come free of charge. The simple truth is that MnSCU would be properly funded if MnSCU administrators didn’t spend money this foolishly. The truth is that MnSCU couldn’t spend that money foolishly if the MnSCU Board of Trustees hadn’t just rubberstamped Dr. Rosenstone’s spending requests. If the MnSCU Board of Trustees won’t pay attention to these things, then they’re utterly worthless. They might as well be disbanded. Finally, students have noticed that MnSCU isn’t run well. Universities are laying off professors. Morale is sinking. Minnesota is experiencing a brain drain competition, which it’s losing. 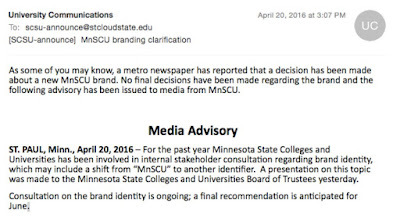 Rather than rebranding MnSCU, perhaps Gov. Dayton should consider fixing the problem by hiring competent people to run things. 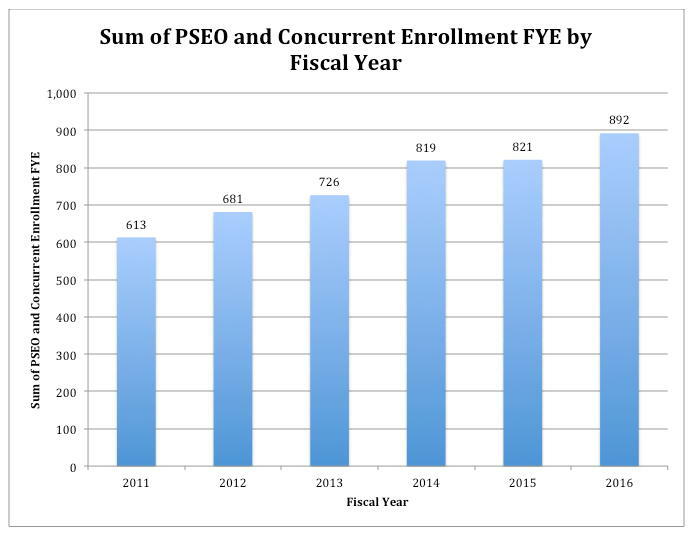 The Enrollment Numbers Are Actually Worse Than They Appear! 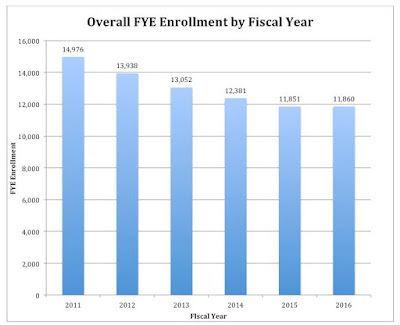 Even with the slight uptick of 9 FYE in FY2016, the decline still amounts to a drop in enrollment of 21.1%. 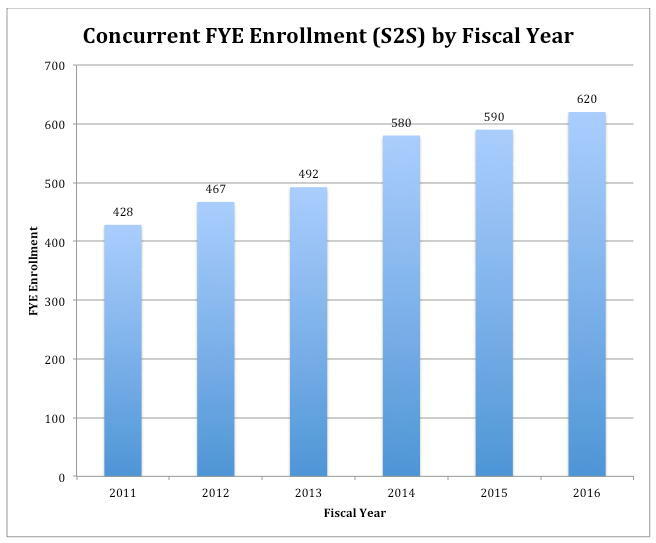 If the data were calculated based on the enrollment in FY2010, the decline is even greater since the enrollment in FY2011 was 15,096 FYE. Of course, there is a lot of hand wringing by the administration and blaming the recession, the subsequent recovery, part-time students, changing demographics and when that doesn’t work simply saying that everybody’s declining. I guess there is comfort in drowning if everyone is drowning? Unfortunately, by avoiding taking responsibility for drowning, no one looks to see if drowning was avoidable in the first place. 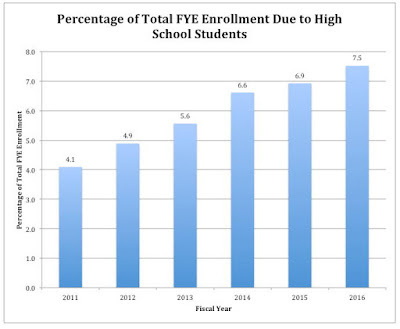 The overall FYE enrollment is a compilation of a lot of different sources: on campus students, traditional PSEO students, concurrent enrollment students, online students and graduate students. Growing from 428 FYE in FY2011 to 620 FYE in FY2016 is a growth of 44.9% in a five-year period! Growing from 185 FYE in FY2011 to 272 FYE in FY2016 is a growth of an even more amazing 47.0% in a five-year period. 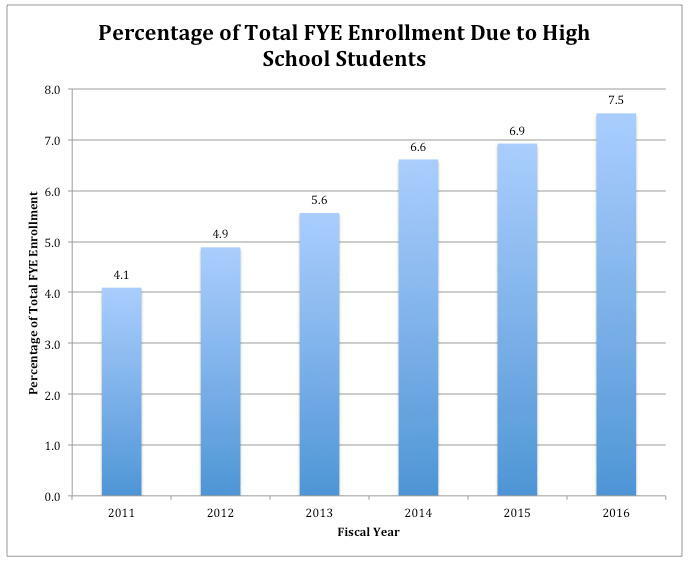 In just five years, the percentage of the total FYE enrollment has grown by an amazing 82.9%! 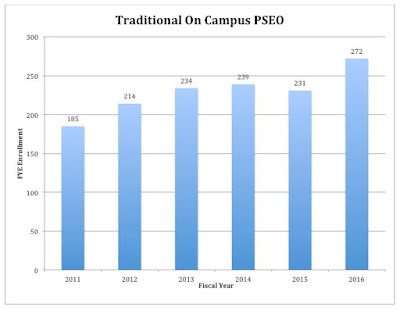 When coupled with the declining enrollment, the number of available ‘traditional’ students has declined from 14,363 FYE in FY2011 to 10,968 FYE in FY2016, which corresponds to a decline of 23.6%. If the data were included for FY2010 to FY2016, the decline would increase to approximately 24.5%! This means that in six years, the number of non high school students that are living on campus, in the surrounding community or commuting to SCSU has declined by nearly 25%! The effect of this decline on the university and the surrounding community is enormous. In 2009, the occupancy rate in the dorms was at 96%. By reducing the number of on campus students by 25% makes for a lot of empty dorms. The problem is only exacerbated by increasing capacity by adding 453 rooms in the Coborn’s Plaza Apartments. Now it should be easy to figure out why they are planning on demolishing W.W. Holes Hall, which might be the first of several dorms to be taken down. If 25% of a population got sick, we’d call it an epidemic. If 25% of a population lost their job, we’d call it a depression. Why is there no reaction when 25% of a student population disappears over the course of six years? One thing is certain. The loss of these students has significantly affected the financial health of SCSU. From reserves that were more than ten million to essentially zero in a few short years. A Composite Financial Index that is negative, and another round of budget cuts totaling more that 10 million dollars, indicates that SCSU is not where it wants to be. Unfortunately, even last week at a town hall budget meeting no details were given other than the administration says they are expecting an increase in some revenues so that the cuts would have to total somewhere in the neighborhood of 7 million dollars. Ten weeks from the beginning of the next fiscal year and there is no plan. At least not one that can be revealed to the public. For an administration that prides itself on being open and transparent, this doesn’t seem very transparent. One needs to look back to a few weeks ago when all of the members of SCSU’s sports programs were summoned to a meeting at which time the closing of six sports was announced. None of the coaches were asked ahead of time how they could reduce expenses. The cuts were simply announced from the top down. I’m assuming that soon after the spring semester ends, the cuts for the rest of the university will be announced. Clearly, the administration’s strategy is to make the announcement AFTER most people have left campus. Some people will be happy, some will be sad. Others will be left scratching their heads wondering and feeling a sense of powerlessness. Plan on the morale on campus taking another hit. When the Ship is Sinking, Rebrand! Unless you live under a rock, you know that MnSCU is experiencing significant financial difficulties. Declining enrollments and poor expenditure decisions have combined to place MnSCU at risk. 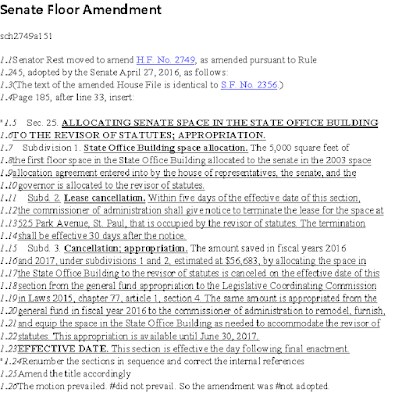 In fact, the situation is so dire that MnSCU made a desperate request to the Minnesota Legislature for 21 million in supplemental funding to MnSCU’s base budget and two weeks ago appeared before legislative committees to justify their request. 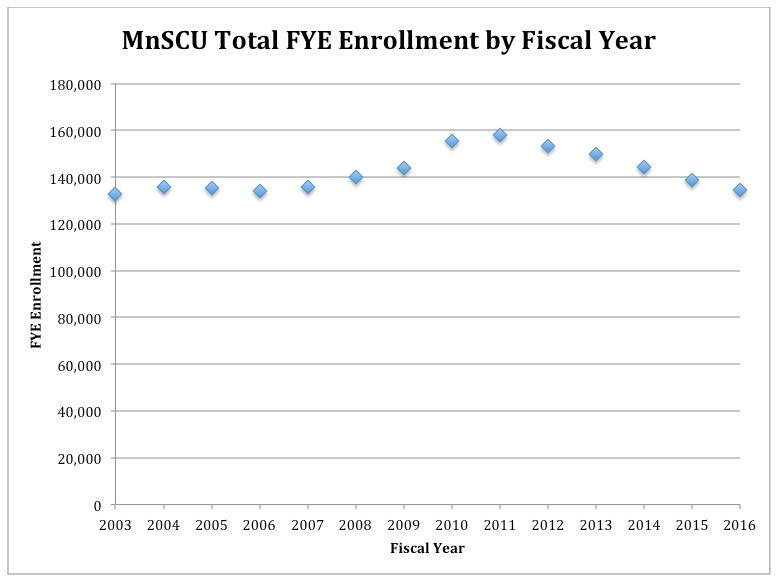 Enrollment at MnSCU institutions has grown for most of its’ existence with the decline in enrollment happening after Steve Rosenstone’s appointment as Chancellor of the system. 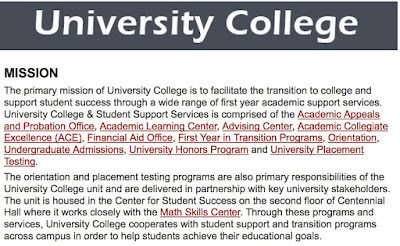 It appears that Chancellor Rosenstone’s solution to declining enrollment is a marketing campaign to make MnSCU look good rather than actually be good. We’ll likely never know where Chancellor Rosenstone got the idea for rebranding. However, it is possible and even likely that he got the idea from one of his biggest supporters: President Potter at St. Cloud State University. In 2011, SCSU, President Potter decided to spend nearly half a million dollars to rebrand SCSU. 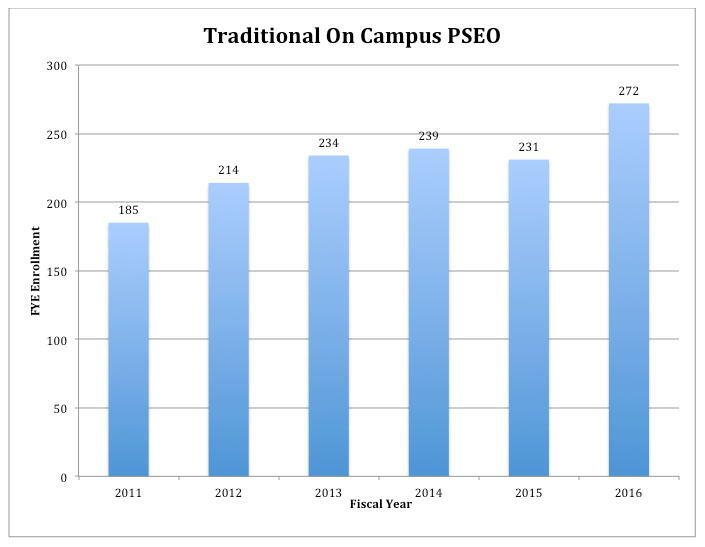 SCSU’s enrollment peaked in 2010. To combat the decline, in 2011 he fired the Vice President for Enrollment Management and decided to enhance the university through a new logo and start a rebranding campaign. The exact amount from the original contracts and extensions with Earthbound Media Group is $459,045.75. The original contract was signed 5/9/11, and there were three amendments. For the MnSCU system, the original $272,00 was spent just to say you should spend more. As a result, an additional $345,000 contract was signed to help roll out the change. To date, it appears that at least $617,000 has been spent to ‘rebrand’ MnSCU. However, the costs are not going to end at $617,000. New signage, stationary, documents, websites, etc. will be needed. Clearly, this will not occur without an additional cost. In early April of this year, the Chancellor announced his decision to retire in 2017 and just barely a few weeks later has decided the rebranding will go forward with the new name and logo. According to an article in the April 19, 2016 St. Paul Pioneer Press, Trustee Bob Hoffman “called the name change and logo change a solution in search of a problem.” So at least one Trustee thinks that the rebranding campaign is a waste of money (especially when nineteen of the MnSCU institutions are experiencing financial difficulties resulting in the development of financial recovery plans). 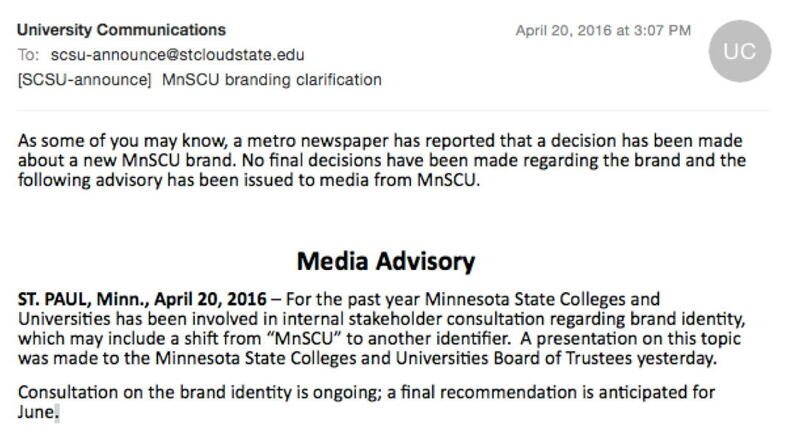 However, not all of the MnSCU trustees, excuse me, Minnesota State trustees, think this rebranding effort is a waste of money. Enough is enough! Any member of the Board of Trustees (whether MnSCU or MS)who voted to approve the funding for the rebranding should resign. The Chancellor should also resign. Spending money on new names and logos does not really solve any of the problems facing the state university system. 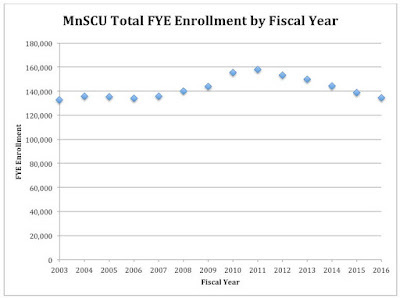 The MnSCU system has financial reserves but without solving the underlying enrollment and expenditure problems, it seems like spending money on rebranding is much like rearranging the deck chairs on the Titanic. We all know how well that turned out! If someone were to try to explain this all to me I think I would just laugh at them in disbelief. However, these are facts. I just can’t wait and see what the next fourteen months with Chancellor Rosenstone at the helm will bring. With the apparent lack of oversight by the Board of Trustees, I’m expecting the future will generate more examples that demonstrate additional examples of incompetence. Donald Trump loves comparing himself to Ronald Reagan. His no-nothing followers have bought into that comparison. That isn’t surprising. That isn’t a fair comparison, though, either. When Trump is exposed as a policy lightweight, which happens frequently, the reflexive response from Trump’s no-nothings is that Trump will hire great advisers. Thus far, there’s no proof that that’s what will happen. In fact, there’s significantly more proof that it won’t happen than proof that it will happen. The important point worth noting is that Ronald Reagan delegated assignments in carrying out his agenda but he didn’t delegate out putting his agenda together. President Reagan didn’t delegate that responsibility because he knew exactly where he wanted to take the United States. That’s because he wasn’t the policy lightweight that liberals thought he was. When he called the Soviet Union the “evil empire”, liberals like Ted Kennedy and John Kerry said this was reckless, that we had to make nice with the USSR. A year after President Reagan left office, the USSR disintegrated. Reagan was a great leader because he knew what he was doing. By comparison, Trump said that he’d become fast buddies with Putin. Trump was foolish enough to state that Putin would destroy ISIS for us. A month after Trump said that, Putin announced that they’d accomplished their mission and that they were pulling their troops out of Syria. Trump looked like a child sent to do a man’s job. The gravitas gap between Trump and President Reagan was shown to be gigantic. Grand Canyon-sized gigantic. Finally, President Reagan wasn’t the immoral man that Trump is. If I was advising Steven Rosenstone, the ‘retiring’ MnSCU chancellor, about communications, I’d quickly teach him the first rule of holes. The first rule of holes is simple. If you’re in one, stop digging. I’d add that, if you ignore the first rule of holes, the second rule is similar but more urgent. The second rule of holes is that if you’re in one and you’ve refused to stop digging, stop digging ASAP. This is consultant-driven thinking. Another term for consultant-driven thinking is stupidity. If MnSCU stopped spending hundreds of thousands of dollars on consultants, administrators and rebranding efforts, they could direct more money towards great professors. That, in turn, would trigger better student outcomes and higher placement rates after graduation. It cost $272,000 for someone to come up with a name they got from a ‘Coach’ rerun? The money could be well spent on many other things. The name change will mean nothing to 99.99 percent of the people. Don’t the administrators have other things to spend their expensive time on? Ms. Kaul-Kennedy’s statement and question instantly put a smile on my face because she’s figured out what’s a priority to her and what’s foolishness. Here’s hoping that the consultants and administrators don’t negatively influence her thinking. When this election is over, what will be the fallout from news consumers on Fox News? Which personalities and hosts will be looking for new jobs? Will Megyn Kelly jump ship for a network job or a show on CNN? One thing that likely won’t change is that Bill O’Reilly will still have his show. His “I’m just a simple man” schtick still resonates with his viewer, most of whom seem to have the intelligence of eighth graders. The most important information from Rove’s WSJ article is when he writes “Mr. Trump’s sweeping victory was impressive. But, as Henry Olsen of the Ethics and Public Policy Center pointed out at National Review, it was also expected.” I’d quibble that it wasn’t totally expected. Trump’s victory exceeded expectations. Still, Trump is trailing the OTT (Other Than Trump) delegates. Changing the GOP platform on abortion requires an uphill fight that Trump wouldn’t win. With the delegates attending the convention, Trump’s position on the bathroom issue resembles a suicide mission. While many northeastern delegates would continue faithfully supporting Trump, he’d be the person losing his constituency attending the convention. According to the National Association of Secretaries of State, by the time Republicans gather in Cleveland on July 18, the deadline for Mr. Trump to be listed on the ballot as an independent will already have passed in 12 states with a combined 166 Electoral College votes. There’s those pesky little details inserting themselves into the conversation again. By the time the convention ends, it would be clear that a Trump third party run was his attempt to hand the presidency to Hillary Clinton. Some of Fox News’ anchors haven’t indulged in drinking the Trump Kool-Aid. Unfortunately for them, not enough of them have refrained from drinking that toxic drink. Last night, during Special Report’s first segment of the All Star Panel, Bret Baier spoke to the complexities of the delegate selection process. While some states’ rules are complex, most are exceptionally straightforward. Moe Lane’s post explain the true complexities of West Virginia’s delegate election system. With few exceptions, though, the delegate election process is pretty straightforward. To people who’ve participated in the process, in fact, it’s pretty routine. Honestly, it doesn’t require years of study to figure it out. What’s upsetting to me is the dishonesty Trump is using in portraying the system as being run by DC insiders and Wall Street fat cats. Recently, he’s hinted that that’s who runs the delegate selection process. It’s time to tell that filthy liar to either tell the truth or to shut up. He’s even had the audacity to ask people how that’s worked out for them. In 2006, Donald Trump contributed to the DCCC and the DSCC. In 2010, thanks in part to Trump’s campaign contributions, Democrats that Trump supported passed universal health care. Prior to his becoming a candidate for the GOP presidential nomination, Trump enthusiastically supported universal health care. To the people who got kicked off the policies that they were satisfied with but weren’t allowed to keep, how’s that working out? The next time you hear Donald Trump, think of how much better your life would be if he hadn’t contributed to Democrats. Donald Trump isn’t part of the solution. He’s been part of the problem for 20+ years. For him to now put himself forward as the solution to Washington cronyism is beyond laughable. I can’t wait until after the California primary. If Trump hasn’t secured the nomination, expect the super PACs to hit Trump hard on this subject. Further, Sen. Cruz’s campaign will hit Trump hard for his shifting views on abortion and transgender ‘rights’. Finally, expect a bloodbath this November if Trump is the nominee. The #NeverTrump movement might not be as potent as the TEA Party was in 2009-10 but it’s still awfully potent. Voting for a northeast liberal who contributed to Democrats isn’t something that principled conservatives will do.